Wednesday, March 23, marked the chemistry department's biannual celebration of Mole Day, which, like Pi Day, celebrates a numerical constant relevant to a discipline with some less than academic components such as a breakfast at George's Restaurant in Willow Street, construction of a "mole pun" out of tin foil, and ample opportunity to earn some extra credit. Mole Day is a holiday celebrated by chemists of all sizes, ages, and nationalities in memory of the famous scientist Amedeo Avogadro (1776 - 1856) and his famous creation. Avogadro is most noted for - you guessed it - the invention of the mole, a constant in the chemistry realm to refer to an amount of a chemical. One mole is equivalent to 6.0221415 x 1023 atoms in any given substance, and chemists use this when converting among units. Aptly, the real holiday is celebrated on October 23rd for the 1023 atoms, but what kind of public institution would Lampeter-Strasburg High School be if it deprived its spring semester chemistry students of the Mole Day festivities? Exactly what the three chemistry teachers thought. In the weeks prior to the imitation date of March 23rd, students were able to win “mole money” by correctly answering curriculum-related questions in class. This currency was then able to be used the day of to enter raffles or participate in an auction. But before any of this started in the building, an extra-credit-seeking 64 students woke up in the dead of night to journey to George’s Restaurant in Kendig Square at 6:02 AM while donning the infamous Mole Day attire of an equation-riddled T-shirt. The students colored in themed coloring pages while waiting for the breakfast from an excellent staff. Once stomachs and drawings were filled, the partying troupe journeyed to the school in anticipation of the chemistry classes to come. Perhaps the most well-known aspect of Mole Day here at L-S is the Mole Day Pun. Students must come prepared with a pun involving the word “mole” to make an “artifact” in class having to do with that pun. Some examples include “moling pin,” “Barak Obamole,” and “molionaire.” Now this artifact was to be made out of an unknown material that always happens to turn out as aluminum foil, and students must then calculate how many atoms are in their artifacts. 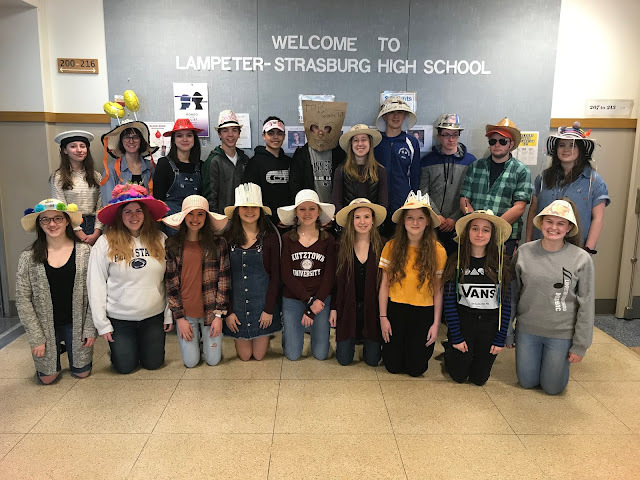 "Mole Day is a great way for students to take a break from the rigors of the classroom and celebrate one of the fundamental concepts covered in chemistry," says Mrs. Melissa Stunja, a chemistry teacher at L-S.
All in all, Fake Mole Day was a success at L-S! Benjamin Pontz contributed to this report.